At w+r we work closely with architects to help facilitate the realization of their designs. 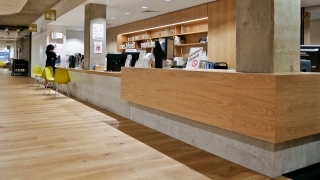 We have extensive experience in producing bespoke concrete countertops and surfaces and other architectural elements such as walls, furniture, fire hearths and steps and can offer advice at the early design stages of a project where fair-faced concrete is to be employed. We can offer consultation on projects with regard to formwork detailing and surface design for fair-faced concrete elements and reviewing of design details with regard to practicalities of formwork construction. Consultation may be in the form of general discourse, method statements or site visits depending on the needs and suitability of each project. Please do not hesitate to contact us for more information on our working methodoligies or if you have a project you would like to discuss.